The HPE Microserver GEN10 is an impressive piece of rock-solid hardware. Of course… ILO is missing compared to GEN8 but for most use-cases thats not a real issue. Upgrading a Netgear switch can be very annoying…i’ve recently bought a second GS108Ev3 and wanted to upgrade the firmware initially but the switch stocks in bootloader mode (still web accessible on 192.168.0.239). By running the upgrade via Firefox or Chromium on Debian the firmware upload stops at ~7% with a timeout error. Same issue with tftp. Use a Windows Machine (Win 10) + Google Chrome Browser and run the firmware upgrade procedure via web interface on 192.168.0.239 – this will even work in case the Netgear ProSAFE Configuration utility throws a timeout error. VERY WEIRD! Overall the (first) switch performs very well over the last few years and draws very low power – a great SOHO product with VLAN capabilities (PVID/Tagged/Untagged) but the firmware needs a makeover..
Grandstream VoIP telephones are very popular because of their high build quality compared to an excellent price. In some cases you want to use an encrypted communication channel between your device and the PBX (e.g. asterisk). The current grandstream firmware includes basic OpenVPN support (client mode, tun) which allows you to tunnel the whole SIP/RTP traffic over an encrypted channel. This is also the best solution to avoid any kind of NAT/routing issues because all devices are directly accessible within the virtual ip subnet. Use the following (minimal) configuration as template. The important options are set to work with the current grandstream firmware (1.0.4.106). Certificate based authentication is preferred for security (login/password not needed)! Add Quality-of-Service rules to your router which matches the OpenVPN port set above. The traffic should be marked with class EF (realtime, expected forwarding) to avoid package lost. Default VoIP rules will not match because of the encrypted channel! Sometime you may need a special version of Node.js or a recent version within a foreign build environment. But in the modern container-based infrastructure it is not possible to use apt to install custom packets which are not whitelisted. As an workaround, you can download pre-build binaries via wget into your build directory and add the bin/ dir to your PATH. This allows you to use any pre-build third party software without installation. # add nodejs binaries to path - this has to be done here! You may use Strato HiDrive as an external storage for team collaboration, internal file-sharing or remote backups. In such cases it can be very useful to establish the secure connection via your corporate UTM Gateway instead on each client. This only requires an additional HiDrive Account which has the ability to connect via VPN (Login allowed via OpenVPN). This solution requires the HiDrive business plans with advanved protocol featureset! First of all, you have to download the official openvpn config package directly from the Strato Website. It contains the CA, TLS-Auth Key as well as a poor OpenVPN Config. 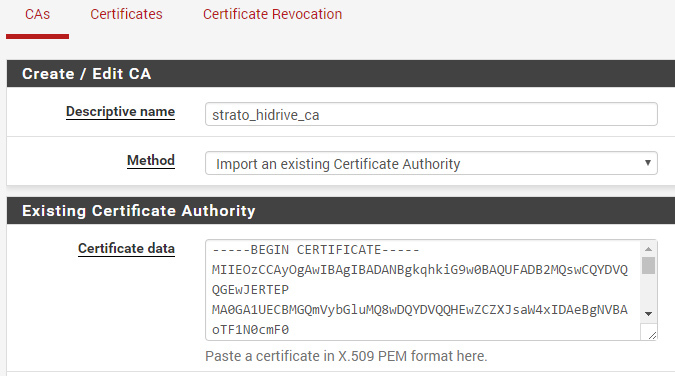 Go into the pfSense Webinterface and add a new CA – paste the content of the ca.drive.strato.com.crt file into the textarea and save it. The CA is now available within the OpenVPN Client config. Finally goto VPN -> OpenVPN -> Clients and create a new instance. You should use a dedicated HiDrive User-Account which has the ability to connect via VPN. Use this account credentials for the OpenVPN User Authentication. 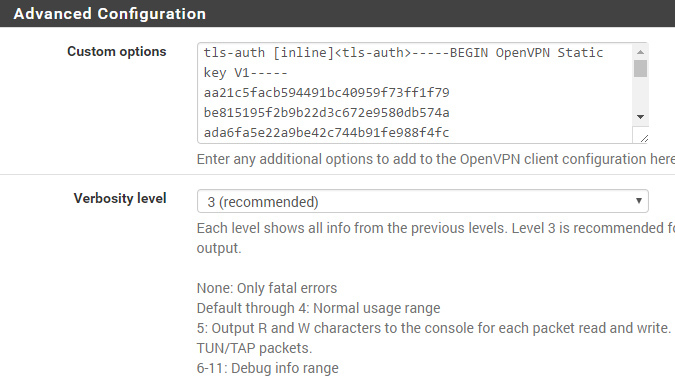 By default, OpenVPN uses BF-CBC as cipher with SHA1 auth – not AES as set in pfSense GUI. This is the most tricky/weak part..Strato is using the TLS-Auth Key in bidirectional mode, which is not recommended. Normally the key-direction 0 will be used for servers, 1 for clients and pfSense is not offering an option to change this via the GUI. But its possible to add the TLS-Auth Key as inline statement under “Advanced Configuration -> Custom Options” without a key-direction (bidirectional by default). Just paste the following code. It contains the TLS-Auth key as of Mai 2017.